M-Audio have packaged a fully featured control surface with motorised faders, an 18-input Firewire interface and eight mic preamps in one box — at a very competitive price. When the Project Mix I/O arrived at the SOS office, we all thought 'Blimey! It looks just like the Digi 002!' Digidesign and M-Audio are now part of the same empire, so it seemed logical that they might have pooled their resources to create new hardware, and both products are variants on the same basic concept. Like the 002, the new unit combines a multi-channel Firewire audio interface with a control surface based around touch-sensitive, motorised faders, and can be used with Pro Tools or any other major DAW. However, M-Audio say that the Project Mix has been developed independently of Digidesign, and on closer inspection, it turns out to be quite different from the 002. In many ways, in fact, it turns out to be better. The Project Mix features word clock I/O, it has eight mic preamps rather than four, it has a shuttle wheel and master fader in addition to the eight channel faders, and there are two headphone outputs rather than one. True, its rotary encoders lack the LED 'ring' displays featured on the 002, and it can't be used as a stand-alone mixer — but on balance, the Project Mix is definitely the more feature-rich of the two. Another difference is that it uses the Mackie HUI protocol to communicate with Pro Tools, rather than the system Digi themselves developed for the 002 and Command 8. The Project Mix also supports the Mackie Control and Logic Control protocols which are implemented by most of the other major sequencers, and is clearly intended as a universal controller and audio interface. 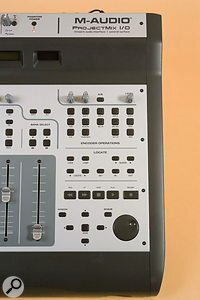 The Mackie Control and some similar products can be expanded by the addition of 'sidecar' units that provide extra fader banks. 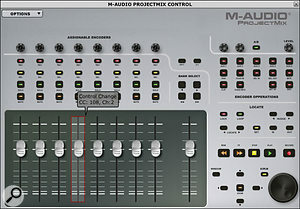 M-Audio say that they have no current plans to offer such an expansion for the Project Mix, which is a pity. The review unit didn't come with any music software at all, and until January 15th, this is how the Project Mix will be sold. After that, however, it will only be available as a bundle with the full version of Ableton Live, with the price rising from £760 to £950. To my mind, this is bizarre. Some Project Mix buyers will already own Live, and the rest would surely prefer to choose their own recording software — after all, one of the Project Mix's big pluses is that it works with everything. And if it has to be bundled with something, why Live? Pro Tools M-Powered, an M-Audio product, would be much more appropriate for the multitrack recording jobs that are the Project Mix's bread and butter. Given its low price, you might expect M-Audio to have cut some corners in the construction of the Project Mix, but it's actually very solid. At 20 inches wide by 18 deep, the case is quite large, and feels very substantial, with rigid moulded plastic surrounds and a metal surface that doesn't flex under pressure. The motorised faders, perhaps the most important components, are reliably touch-sensitive, acceptably smooth and quiet, and are full-length 100mm devices rather than the 60mm efforts some companies inflict on us. Some manufacturers of cheap control surfaces save money by not including a display, but the Project Mix's two-line LCD is clear and bright. There are no dedicated meters, but in most applications the LCD can be used to display channel levels. Cost-cutting rears its head only in a few details: the plastic gain knobs and rotary controllers look cheap, the laptop-style external power supply doesn't inspire confidence, and the shuttle wheel wobbles a bit. But hey, at least it's got a shuttle wheel, unlike many budget controllers. Six-pin to six-pin and six-pin to four-pin Firewire cables of decent length are included. Installing the drivers from CD was straightforward, and although it generated a couple of error messages while attempting to uninstall my existing M-Audio Firewire drivers, worked first time. The Project Mix comes with a very brief, fold-out Quick Start Guide and a PDF manual. The latter is not exactly comprehensive, and although it tells you the function of each control, you will need to consult your sequencer's own documentation to learn how it works with a control surface. In terms of its capabilities as an audio interface, the Project Mix I/O is almost identical to another M-Audio product, the Firewire 1814: so similar, in fact, that I won't go into details here, but will refer anyone who's interested to Martin Walker's review of that unit in SOS October 2004. As on the 1814 there's an assignable level controller, which can be set to adjust various important signals such as the level of the main stereo output, and an A/B switch which can either be used to turn direct monitoring on and off, or to switch the source of the first headphone output. Apart from the analogue gain controls and Mic/Line switches, the Project Mix's front panel offers only very limited control over the its audio interface parameters, most of which must be adjusted in software from with the Control Panel utility. Where the Project Mix improves over the 1814 is in its analogue circuitry: there are eight rather than two mic preamps, there's a high-impedance jack socket for connecting electric guitars directly, and all eight line inputs are on balanced jacks. I noticed no difference at all between the sound of the 1814 and the Project Mix. The preamps are clean and quiet, with plenty of gain, the guitar DI socket worked as expected, and the headphone outputs put out a decent level. A vintage Neve desk it ain't, but I think it's fair to say that most of those who will buy a Project Mix are unlikely to find themselves limited by the quality of its preamps or converters. In any case, you can always attach third-party preamps and converters thanks to the ADAT I/O. At launch, the Project Mix had three control modes, for Cubase SX, Logic and Pro Tools, and a firmware update shortly after release added support for Digital Performer, Sonar and Ableton Live. However, Pro Tools users had to wait until the launch of version 7 to access the Project Mix's audio interfacing. PT7 is reviewed elsewhere in this issue, but as the M-Powered version wasn't available until late in the review period, I began my tests with Cubase SX instead. As is the case with most control surfaces, many of the buttons take on different functions in different applications, but the labelling seems to be based primarily on Pro Tools. For instance, the five Aux buttons allow you to set the levels of sends 1 to 5 in Pro Tools, but work differently in Cubase.Photo: Mark EwingAs far as Cubase is concerned, the Project Mix I/O has nearly the same functionality as the Mackie Control it emulates. That is, it's of limited use for setting up projects or editing audio and MIDI, but it's very useful for tracking and mixing. Things that you can do easily include setting levels and pan positions, locating the Project Cursor, nudging, looping, scrubbing, setting Markers and in/out points, soloing and muting channels, global vertical and horizontal zooming, track arming and recording, setting FX send levels, making real-time parameter changes to software instruments and effects, selecting Events on the Arrange page and toggling between the Arrange and Mixer pages. Things that you can also do, but with more difficulty, include selecting, inserting and editing audio and MIDI effects and VST Instruments. A list of what you can't do at all would include creating, naming and deleting tracks, choosing input and output routings, accessing off-line audio or MIDI processes, opening or using Editor windows, zooming individual tracks, and changing tracks' automation status (this is possible on Mackie Control, but not here). Unless the Flip button is engaged, the faders always control (and reflect) the positions of the faders of the eight channels in the current bank, while buttons adjacent to them shift this selection up or down by a single channel and in banks of eight. Touching a fader automatically selects that track within Cubase, which is sometimes what you want, but not always: there are times when you want to be able to adjust the volume of other tracks without having to remember to return the focus to the one you're recording on. The rotary encoders default to panning duties for the eight channels in the current bank, but five Aux buttons switch them to controlling the eight FX sends for the selected channel, selecting that channel's insert effects and switching them off or on, doing the same for the first eight slots in the VST Instrument rack and Master effects, and controlling the EQ on the selected channel. There are no dedicated Page up and down buttons, but in all of these modes, holding Alt and pressing the Bank Select buttons allows you to access deeper-level parameters, such as controls for the plug-ins you've selected. When I first switched the Project Mix on, the shuttle wheel worked backwards. However, hitting the Setup button accesses various housekeeping functions, one of which is Jog Wheel Calibration, and after I'd visited this, everything was normal. There are things I don't like about the way Cubase deals with the shuttle wheel, but these are Steinberg's fault rather than M-Audio's. The most annoying is that if you have Snap to Grid enabled in Cubase, but you stop the transport with the Project Cursor between grid lines, the shuttle wheel will retain that offset from the nearest grid line rather than actually snapping. One or two of the Project Mix I/O's buttons have no function within Cubase, but in general, the mapping of available controls onto functions is sensible and logical. Although there are separate Alt and Shift buttons, most commonly used functions can be accessed without them, and they're reasonably well placed at the top between the rotaries and the Aux buttons. The Project Mix does lack some Mackie Control features that are supported in Cubase, including the Fader Groups buttons, the user-definable Function keys, the Solo Defeat button, the LED song position display, the channel activity and Rude Solo LEDs and the ability to deactivate the fader motors; the ones I missed the most were the automation Read and Write buttons and the Undo and Redo keys. None of these is vital, however: the latter functions are easily accessed from the QWERTY keyboard, and thanks to the touch-sensitive faders, you can put Cubase 's automation into Touch mode and leave Read and Write permanently enabled for all tracks. On the plus side, the Project Mix I/O's labelling is sometimes more logical than that of the Mackie Control, and of course there's no need to connect it to a separate MIDI port on your computer — all the control data is handled via the Firewire connection. As with most control surfaces, some of the tasks that are possible with the Project Mix I/O in Cubase are so much easier from the computer keyboard that you'd have to be very determined to do them any other way. For instance, you can use one of the rotaries to select which VST Instrument is installed in which slot in the rack, but you can't select that VST Instrument as an output for your chosen MIDI track, and this is a setting that needs to be made every time you select an Instrument. With VST plug-ins that report their parameter names back to the host, you can have a lot of fun making real-time parameter changes: however, not all plug-ins are well-behaved in this respect, and the likes of Sampletank quickly sent me back to my QWERTY keyboard. Also, for some reason, not all the VST plug-ins on my computer showed up as available for selection from the Project Mix I/O, although I could choose them with the mouse from the insert slots on screen. Photo: Mark Ewing As well as having preset modes dedicated to specific applications such as Cubase and Logic, the Project Mix also acts as a fully configurable MIDI controller. Hit the MIDI button on the control panel and launch the Control utility from the Start menu, and you will be greeted with an on-screen replica of the Project Mix. Hovering the mouse pointer over any button, fader or rotary controller will tell you what MIDI data it is set up to output, and on what channel. Clicking with the mouse then allows you to change this assignment. The faders, rotaries and shuttle wheel can output any MIDI Continuous Controller value (but not NRPNs), while the buttons can send any MIDI Note On at any velocity value. When you've set the on-screen version up to your satisfaction, you can then dump its settings into the hardware Project Mix, which should remember them. The Control utility can also be used to update the Project Mix's firmware. This could be a fantastically useful facility for those who want to control a piece of software that is not directly supported by the Project Mix. To test it, I used the Project Mix's Control utility to assign the preset drawbar CC values in Native Instruments' B4 II to the faders: it was quicker and easier than using B4 's MIDI Learn feature, and the results worked perfectly. However, there are areas where the Control utility could be improved. The dialogue boxes where you enter CC or note values are wrongly named: for instance, clicking on a fader tells you that you're entering CC values for a Mute button. More importantly, there's no way to save or load Project Mix setups within the utility, and nor can you store more than one user setup within the Project Mix itself. It would be nice to be able to set up a number of different templates for different applications, but as things stand, this is not possible. It would also be handy if there was a way to switch all the parameters to a different MIDI channel in one go — opening 60-odd dialogue boxes in order to do this takes forever. Hopefully, M-Audio will continue to develop this utility and add some of these features in a later version. Support for Mackie Control was added in the latest version 5 of Ableton Live, and provided you have recent enough firmware, you can put the Project Mix into Live mode by holding down Aux 5 as you switch on. All you have to do then is visit the MIDI/Sync section of Live 's preferences and tell it that a Mackie Control is attached. Live mode wasn't mentioned in the version of the Project Mix I/O manual I saw, but with the aid of Live 's own documentation it's not too difficult to work out which button does what. The Window button toggles between Session and Arrangement views, and once again, the basic Pan mode sees faders and rotaries used to control track level and pan, with the record arm, select, solo and mute buttons doing what you'd expect. And just as for Cubase, you can change the focus to access settings that are specific to a channel, such as effects sends. Unlike Cubase, however, Live 's Mackie Control implementation depends heavily on a feature that M-Audio have left out of the Project Mix: the ability to use the rotary encoders as momentary buttons. For instance, pressing the Plug-in button shows the Devices that are active on the selected track, and according to the Live manual, you should be able to select a Device for editing by pressing the corresponding rotary encoder. Since the Project Mix's rotaries only respond to twisting, and Live wasn't mentioned in the documentation, I thought that this wasn't possible. Just as we went to press, though, M-Audio's technical people told me that you can select Devices by holding down the Alt key and pressing the channel's Sel key. It was too late for me to test this arrangement, but it seems logical, and should make the Project Mix a good companion for Live. I still think Live is an odd choice to bundle with the unit, though! Version 7 of Pro Tools M-Powered finally arrived towards the end of the review period, so I was keen to try it out with the Project Mix. To set Pro Tools up to be controlled from the Project Mix, you simply tell it that an eight-fader HUI is attached. As you might expect, M-Audio have put a lot of thought into the way that the Project Mix integrates with Pro Tools, and the way the buttons are labelled suggests that the designers worked with this application in mind above all. You could also argue that Pro Tools is intrinsically more suited to hardware control than some other software, thanks to its simple two-window interface. Either way, you can certainly do everything that's possible in Cubase, and more. It is, for instance, straightforward to choose input and output routings for tracks in Pro Tools, while the In and Out buttons allow you to make selections on the fly. 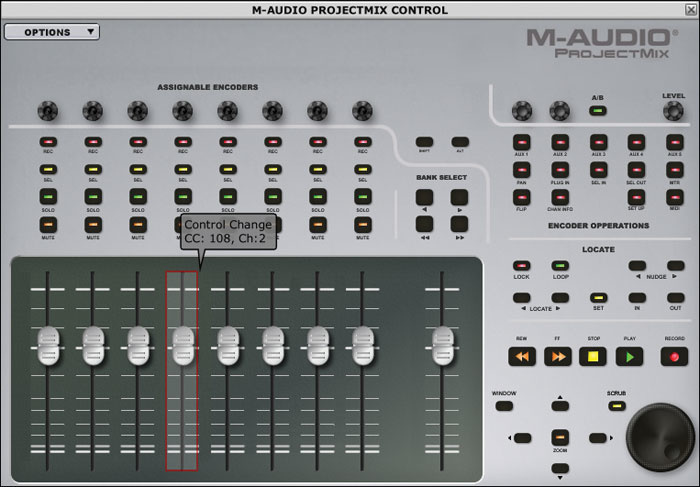 The Project Mix I/O improves on M-Audio's Firewire 1814 interface by offering eight mic preamps and balanced line inputs. Photo: Mark EwingThe Project Mix's shuttle wheel does nothing in Pro Tools unless either the Zoom or Scrub buttons are pressed. When the Zoom button is unlit, the arrow keys have the same navigation functions as the 'P', semicolon, 'L' and apostrophe keys in Command Focus mode. With the Zoom button lit, they control global horizontal zoom, and vertical waveform zoom for all audio tracks (it would be much more useful if they controlled track height, preferably on just the selected tracks, but there you go). Pressing the Zoom button again makes it flash, whereupon you can use the left and right arrow keys in conjunction with the shuttle wheel to select Regions or horizontal sections of a Session. The Scrub key, meanwhile, cycles Pro Tools through its two scrubbing modes. Despite the slightly wobbly feel of the shuttle wheel, I found it perfectly usable for locating edit points. It took me a while to get my head round the way that plug-in editing from the Project Mix works in Pro Tools, but it is possible. Once you have worked it out, it's slightly more practical than in other applications, though in my view it's still easier to use the mouse. Again, some third-party plug-ins either have too many parameters or don't report their names properly, but at least Digi's own Digirack processors are well-behaved. Oddly, there's only room to display four plug-in slots on the Project Mix's screen at once, and you have to visit a separate page to bring up the fifth. It's also a shame that inserting and selecting plug-ins from the Project Mix doesn't automatically bring up their editing windows in Pro Tools. The main point of a control surface is to help out during mixing, and in this respect the Project Mix works very well in conjunction with Pro Tools. It's easy to automate track levels, send levels and pan for mono tracks, and quite easy to automate plug-in parameters, although you have to select them for automation first within the plug-in window. Again, the fact that you can't change tracks' automation status from the control surface isn't too much of a problem: you can simply put all tracks into Latch mode for an initial pass and then switch them to Touch mode for fine-tuning. With Pro Tools 7 being a major new version, there are a few areas that suggest a game of catch-up between M-Audio and Digidesign's development teams. For instance, pressing Alt plus the left arrow key is supposed to return the cursor to the Session start, but sometimes doesn't work. Elsewhere, the Project Mix's graphical display of pan positions went awry occasionally, and I also managed to crash PT7 on one occasion by hitting Scrub while Zoom mode was active, although I couldn't repeat this reliably. I didn't encounter any serious problems, though, and I'm sure that any small inconsistencies will soon be cleared up by service updates from Digidesign. 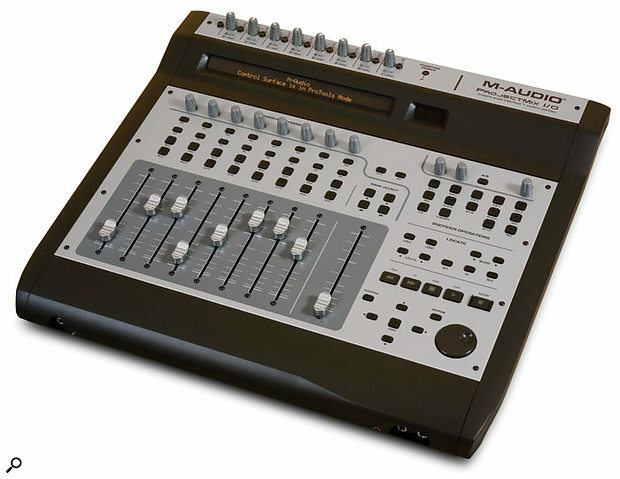 When it was first announced, M-Audio set a recommended retail price of £759.99 for the Project Mix I/O. This later turned into an 'introductory offer', but if you can get it at this price, it represents excellent value. It's lower than the current street price of the Mackie Control Universal — and although the Project Mix lacks one or two of the Mackie Control's features, the Mackie Control doesn't have eight mic preamps and an 18-input Firewire audio interface! To get close to the Project Mix's functionality you would need to add something like a Presonus Firepod, taking the total cost well over £1200, and even then you wouldn't get ADAT or word clock I/O, nor the advantages of having your audio interface, monitoring controls and fader surface integrated in one box. There are, of course, other one-box products in this vein, and the Project Mix compares well to most of them, too. The Digi 002/Pro Tools LE bundle has fewer features and still costs over £1500 at current street prices. Yamaha's 01X is another possible alternative: it boasts built-in DSP mixing capabilities and comes with a decent software bundle, but lacks ADAT I/O, has 60mm rather than 100mm faders and has only two XLR mic inputs. It's now available at under £800 on the street, which is also good value, but perhaps suggests that the mLAN protocol hasn't taken off in quite the way Yamaha intended. The most direct competitor is probably Tascam's FW1884, which was launched two years ago at £1299 but is, again, available at under £800 in some shops. Like the Project Mix I/O, the FW1884 combines an 18-input Firewire audio interface with eight mic preamps and a nine-fader control surface based on the Mackie Control and HUI protocols. In some respects, the 1884 has the edge: it features insert points on the analogue inputs, eight analogue line outputs rather than four (making it suitable for 5.1 surround monitoring without extra hardware), and four MIDI Ins and Outs to the Project Mix's one. It can also be used as a stand-alone mixer, and can be expanded with a sidecar called the FE8, each of which adds an extra eight faders. However, it lacks any kind of display — which is important if you want to use a control surface for more than track levels and panning — and implements a slightly different set of Mackie Control features. There is no way to edit plug-in parameters from the 1884, but unlike the Project Mix, it has dedicated buttons to set automation modes, plus editing features such as cut and paste, and undo. Oh, and of course the 1884's audio interface won't work with Pro Tools. In the past, I haven't found small control surfaces for digital audio workstations useful enough to justify their expense. It's not that products such as Mackie Control and Digi 002 are overpriced for what you get — after all, something with that many buttons, pots, faders and displays is never going to be cheap to make. It's more that even with all those controls, you never get enough functionality to leave the QWERTY keyboard behind, and the intuitiveness of hands-on mixing is eroded by endless bank switching and shifted key combinations. However, products like the Project Mix make Mackie Control-style mixing so affordable that even the diehard sceptic will have to think again. 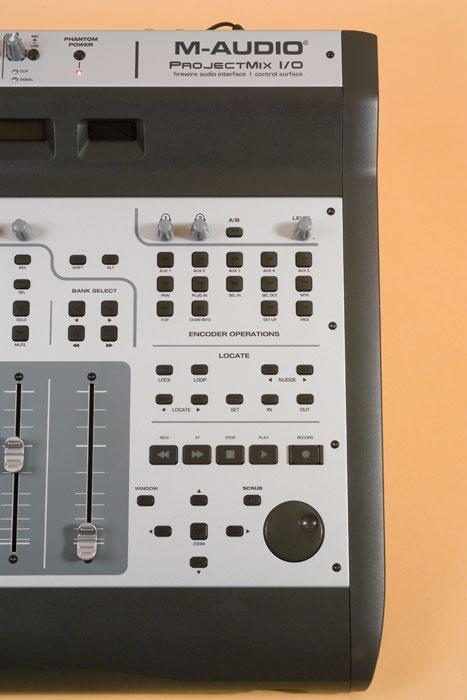 At its £760 introductory price, it would be hard to find a competing product with just the preamps and audio interfacing, let alone a fully featured control surface. You could think of the Project Mix as a nice audio interface with a free hardware controller! Even if you only ever used the transport buttons, this would be good value, and if you're one of those people who hates mixing by mouse, it's a bargain. It will still be pretty competitive even when the price reverts to £950 on January 15th, but I think there are rival manufacturers who will be very relieved! Superb value at its introductory price. Eight mic preamps, and 18 (eight analogue plus eight ADAT or stereo S/PDIF) audio inputs. Nearly complete Mackie Control emulation. Faders and buttons can be configured to send any MIDI CC or note value. After January 15th, it will only be available as a £950 bundle with Ableton Live. The utility used to configure the Project Mix's MIDI mode is a bit crude in its current form. The Project Mix combines an 18-input audio interface, an eight-channel preamp and the near-equivalent of a Mackie Control — and if you move fast, it's a bargain at £760. £759.99 until January 15th; then £949.99 with bundled Ableton Live. Prices include VAT.